Summer is prime time for hitting the trails and the waterways of America’s gorgeous backcountry. Which also means it’s prime time for running into the critters, large and small, for whom that backcountry is home sweet home. Every summer, headlines are made over unfortunate (or unwise) wildlife encounters across the country. Many of those encounters result from ignorance (or just plain bad decisions), and all things considered it’s the beast that tends to suffer the worst consequences. Staying aware out in the wilds and giving any animal the space and respect it deserves will likely keep you out of harm’s way nine times out of 10, and meanwhile chances are the run-ins with those furred, feathered, and scaly cousins of ours will rank among the clear highlights of your outing. Here are some basic tips for staying safe around some of the USA’s bigger, toothier wild animals. No critter on the continent inspires the fear that a grizzly does, and to some extent that’s justified given the power of Ursus arctos horribilis. 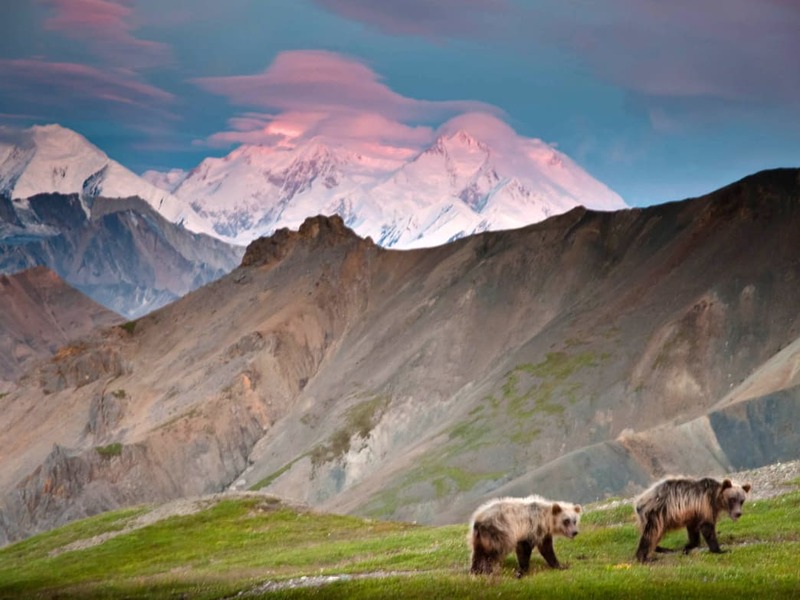 Come of evolutionary age on the sketchy Ice Age plains of North America, where a mother bear had to defend her cubs against all sorts of gnarly beasts, the grizzly became more aggressive and assertive than its Eurasian brown-bear ancestors. 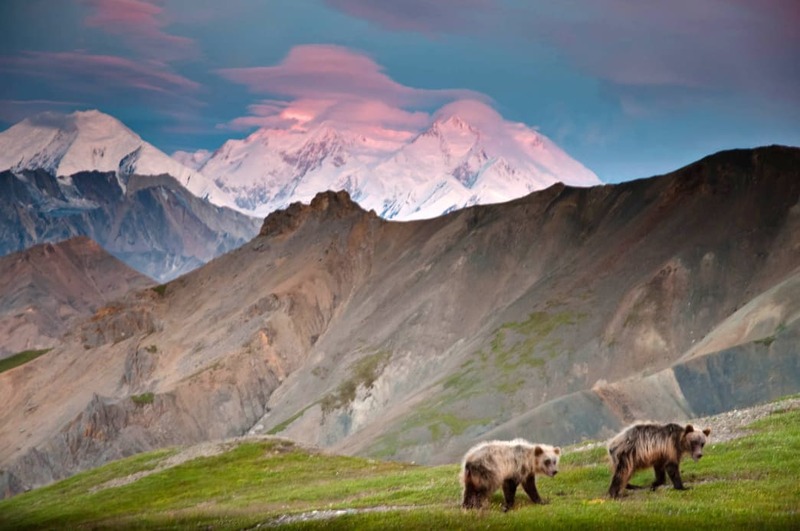 Grizzlies have contended with a couple of centuries of persecution at human hands, which has driven them to a shred of their former dominion and bred plenty of leeriness of humankind into their modern makeup. These “silvertips” generally want nothing to do with people, who tend to mean only trouble. In griz country, hike in groups whenever possible, and make noise along the way—especially in dense timber or thickets, or along streams. Loud talking, shouting, and clapping tend to be more effective than those twinkly bearbells. And definitely carry bear spray in a belt holster (and know how to use it; more on that below), so it’s at the ready if you spring upon a bruin. 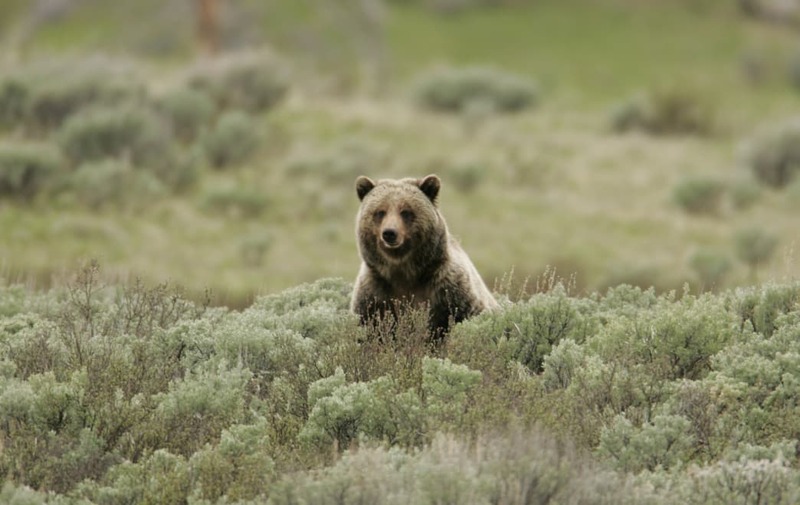 If you see a grizzly and it doesn’t appear to have seen you, detour around it as widely as possible (and downwind, if you can). If the bear’s noticed you, speak calmly, slowly backtrack, and leave the area; if it’s possible to position yourself upwind, do so in order to clue the bear in to your identity. Grizzlies often rear onto their hind legs to better see and especially scent potential danger—don’t interpret that move as antagonistic. If pepper spray fails and the grizzly attacks, drop face-down and play dead, clasping your hands around the back of your neck elbows hugging your head. Normally an attacking grizzly winds down its assault once it decides you’re no longer a threat. Don’t bother trying to climb a tree to escape a grizzly: They aren’t awesome climbers, it’s true, but they can claw their way up a trunk, and besides they have impressive reach. As the legendary Doug Peacock writes in Grizzly Years, “For every grizzly who would stand there watching you scramble up a pine tree, there are a dozen others who are irresistibly triggered by your frantic scrambling to take a bite out of your rear.” Food (ahem) for thought! A caveat with the playing-dead deal: If a grizzly ever tries to drag you out of your tent at night—fortunately a very uncommon occurrence, but obviously nightmare material—definitely fight back: This is likely one of the rare instances where the bear is investigating you as prey. Where to Be Aware: Most of Alaska and, in the Lower 48, primarily the Greater Yellowstone and Northern Continental Divide ecosystems, but also parts of North Idaho, northeastern Washington, and the North Cascades. The black bear—North America’s smallest bear, but still sometimes well exceeding 600 pounds—inspires a wider range of responses among outdoorspeople than the basically universally respected grizzly. Some folks are irrationally terrified of black bears, but many lean too far in the other direction, underestimating the animal’s strength and grit. Black bears are smaller and generally less feisty than grizzlies, but they’re still enormously powerful and well-armed omnivores. A 2011 study published in The Journal of Wildlife Management significantly enlightened the way we think about the danger posed by black bears. If, statistically speaking, the most dangerous grizzly bear is a sow defending her cubs (or a griz defending a carcass), the most dangerous black bear is a lone male (boar) gauging you as a potential meal. Your response to a black bear acting agitated in your presence—flattening its ears, huffing, clicking its teeth, swatting the ground—should basically be the same as to a defensive griz: Ease away or around without running, holding your ground in the face of a charge (a rarer response in black bears). But if the black bear approaches you without making much noise, with upraised rather than flattened ears—suggestive of a potentially predatory animal—you should vigorously discourage it: Make yourself as big as possible, shout at the bear, and if it continues to advance, use your bear spray—or, lacking it, chuck stones or sticks. If such a bear attacks, fight back with all you’ve got. Such a response can also deter a black bear that’s not necessarily looking to eat you, but rather has become conditioned to expect handouts or leftovers from people. 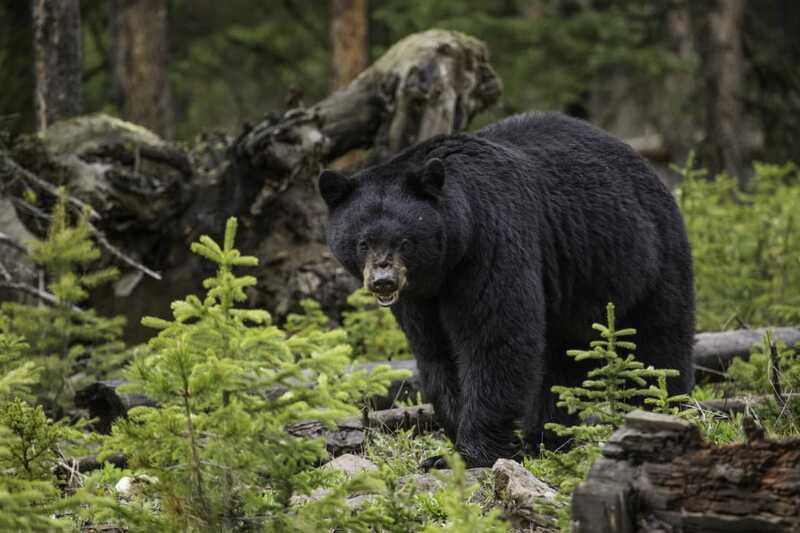 Where to Be Aware: Much of North America is black-bear country. 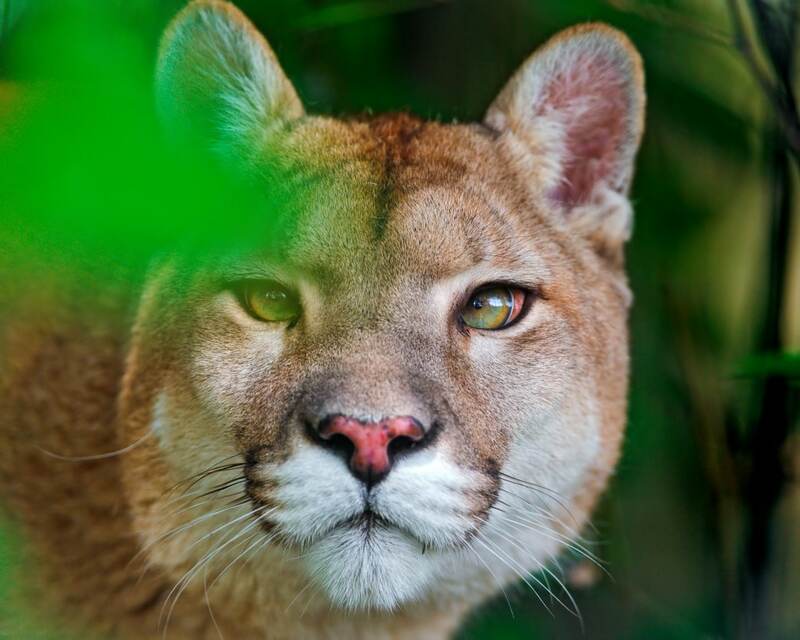 Not counting the bulkier jaguar that ranges into the American Southwest, the puma (or mountain lion, or cougar) is the largest cat in the United States: Big males (toms) may reach 200 pounds or more. Like any big cat, it’s a magnificent hunter: a preeminent deer stalker, and muscle-packed enough to grapple down full-grown elk singlehandedly. Yet while the average human being is smaller (and punier) than such hoofed quarry, puma attacks on people remain quite rare. In May 2018, a particularly unusual and tragic attack did occur in the Cascade foothills east of Seattle that resulted in the death of one mountain biker and injury to another. A necropsy on the tom puma that attacked—despite the cyclists fighting back—showed no abnormalities or disease; the roughly three-year-old cat was on the light side for a tom (about 100 pounds), but didn’t appear emaciated or in otherwise poor condition. No easy answers for the cat’s aberrantly hostile behavior, in other words. Bear spray should work just as well against a puma as a bear, so it’s a good idea to carry it just for insurance when you’re recreating in mountain-lion country—even though you probably won’t need to use it. The victims in the Washington attack did the right thing by fighting back, although the cyclist who was killed ultimately ran from the puma—never a good idea (although a perfectly understandable response, especially given the cat’s persistence in attacking). All things considered, count yourself lucky if you spot a puma out in the backcountry: The cats are the most phantasmal of our big carnivores and normally make every effort to stay out of our sight. (And for practicing your puma-ID skills, check out Dr. LaRue’s Twitter feed for her Friday #CougarOrNot challenges.). Where to Be Aware: While young male pumas are increasingly dispersing into the Midwest—perhaps a reoccupation of historic range that Dr. LaRue and her Cougar Network colleagues are documenting—you’ll mainly be sharing space with the cats in the western sector of the country, plus the South Florida wilds (home to an imperiled regional ecotype, the Florida panther). Thick-bodied, toothy, and sometimes well over 12 feet long, the American alligator is an intimidating beast, no question. It’s not nearly so dangerous as certain Old World crocodiles, but the gator certainly commands respect: Even a medium-sized animal is more than capable of severely injuring or killing a person. As ecologist and gator expert Adam Rosenblatt of the University of North Florida notes, an alligator looks upon nearly anything as a potential prey item, and, like a shark, may “explore” such an object of interest with its heavy-duty chompers. Sometimes a human being attracts that sizing-up interest: mostly children, but adults, too, if it’s a big enough gator. Wading, swimming, or dangling a foot in waters inhabited by large alligators is potentially risky, especially late in the day and during night, when the reptiles are more active. “My usual advice is to stay out of bodies of freshwater at night anywhere in the gator’s range, and to do some research about the abundance of gators in an area before jumping into any body of freshwater in the gator’s range, even during the day,” Rosenblatt says. And if you’re primitive camping or backpacking in gator country, avoid washing dishes in bodies of water where gators can live. The worst situation is a gator that’s accustomed to being fed by people: whether directly through handouts—never feed wild alligators, OK?—or indirectly, as when anglers carelessly dispose of fish scraps around an alligator. Such an animal may well approach you and potentially become aggressive, and you should get away as quickly as you can. Rosenblatt also advises caution during the spring breeding season—when bellowing male (or bull) gators may be feistier than usual—and during summer nesting time, when mother gators actively defend their brood. If you stay aware, exercise caution, and pay alligators the respect they very much deserve, you can usually recreate safely in gator country, appreciating the privilege of sharing space with these epic reptiles. Let’s say, however, that the unthinkable happens, and you find yourself in the not-cool position of being seized by an alligator. “If you find yourself in the jaws of an alligator,” Rosenblatt says, “your best bet is to fight back as hard and for as long as possible. If the gator feels you putting up a big fight, they’re likely to decide you’re not worth the effort and let go. Where to Be Aware: Waterways across the southeastern United States, as far north as North Carolina and Arkansas, and as far west as central Texas. North America has a fair share of magnificent venomous snakes, from the brilliantly patterned (and potent) coral snake to the regal eastern diamondback rattlesnake, which may rarely exceed seven feet in length and ranks among the heaviest venomous serpents on the planet. Hearing the abrupt dry chatter of a rattlesnake in the brush, or coming face-to-face with the gaping maw of a cottonmouth (aka water moccasin) tends to be a humbling experience. Snakes, though, suffer from one of the most unjustified bad reputations of any animal. Their danger is hugely overrated, and yet people kill countless numbers of them every year out of fear and even outright hatred. When you’re talking about such efficient predators of rodents and other small creatures, such shameful slaughter—especially when considered alongside habitat loss and roadkill mortality—can have a real ripple effect on local ecosystems. Long story short, you should value serpents and cherish the occasional sighting. As David Steen, a research ecologist with the Georgia Sea Turtle Center and one of Twitter’s highest-profile snake authorities, points out, our native pit vipers—which account for all of the country’s venomous snakes save the coral snake—“generally use their camouflage to avoid conflict,” and so most times you wander past, say, a rattler or a copperhead, you won’t even know it. 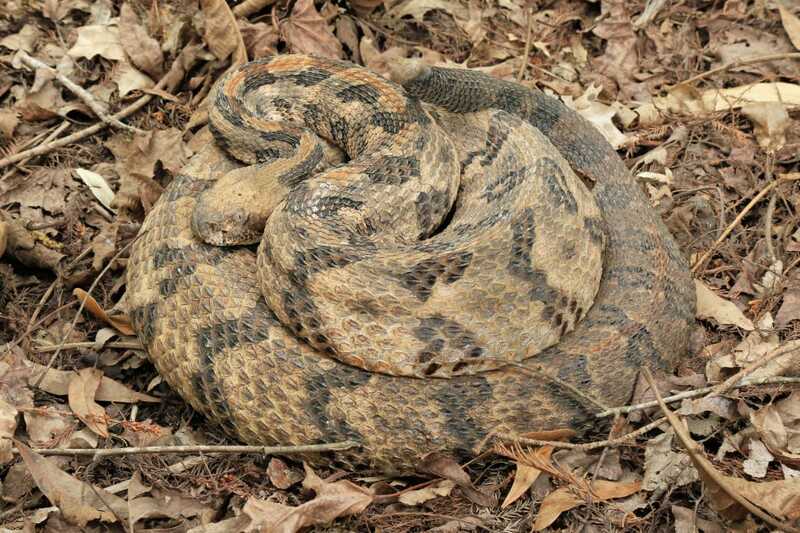 The intimidating rattle of a rattlesnake or the open-mouth display of a cottonmouth are defensive warnings, not aggressive assaults. Where to Be Aware: Most of the Lower 48 States outside of the boreal fringe and high mountains have one or another venomous snake species. You’d think the massive bulk, thick horns, and surly look of North America’s biggest land animal would dissuade spindly humans from invading its personal space—but it happens every year in Yellowstone and other corners of the American bison’s scattered and spread-out range. 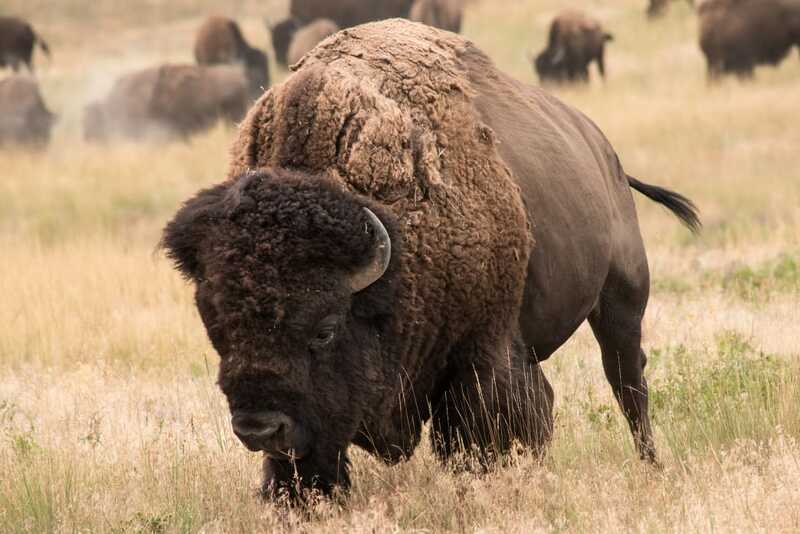 For all the lumbering and blank-stare ruminating they do, bison are swift runners and deceptively agile; if you’ve pissed one off at close quarters, good luck trying to outrun or outmaneuver it. Whether on Yellowstone’s volcanic grasslands or the White River Badlands’ mixed-grass prairies, steer at least 50 yards clear of bison. If you run into herds blocking the trail in Yellowstone’s backcountry (which is not uncommon), don’t try to persuade them to yield it, and make a generous detour. Give bison space, and they’ll leave you alone—though they may definitely cast a few dismissive stares your way. Where to Be Aware: The sprinkled pockets of buffalo range in the Central Lowlands, Great Plains, Rocky Mountains, and Colorado Plateau—plus parts of Alaska, where the boreal form called the wood bison was recently reintroduced. The same advice goes for moose, those enormous and sometimes cantankerous deer with the swollen-looking schnozzes and humped shoulders. Moose aren’t out looking to put a beatdown on people, but they don’t tend to take kindly to hikers who get too close—and that’s especially true of cows with calves. Moose will kick viciously with their front legs, and needless to say a blow from one of their hooves can pack a heck of a punch. 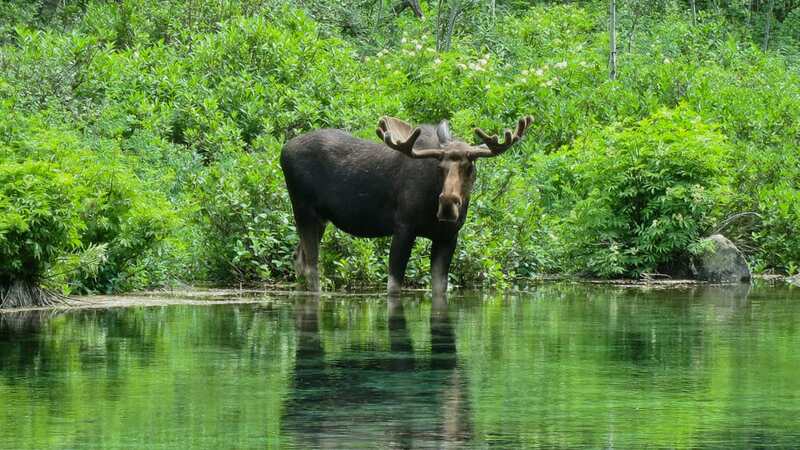 Stay especially alert in willow, alder, and other shrub thickets edging the ponds and lakes where moose often browse. Give any moose you run across a generous berth, and if the animal has noticed you, retreat gingerly while talking in a soothing voice. A moose that’s flattening its ears, bristling its hackles, and/or walking stiff-legged in your direction may be preparing to charge. Unlike with a bear, you should definitely run from an oncoming moose, which don’t tend to chase people for very long. If a moose does overtake you, get down into a ball, shield your head, and don’t fight back; hope the moose decides it’s extinguished the threat sooner rather than later. Where to Be Aware: Much of the Northeast, Upper Midwest, Rocky Mountains, and Alaska. Wait, what? Mountain goats? 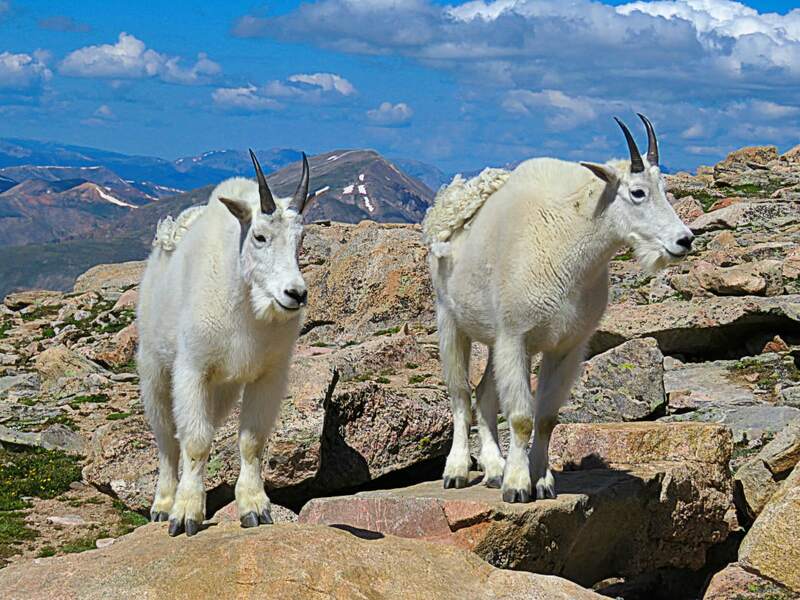 Aren’t mountain goats those handsome, snowy-robed plant eaters fond of posing against photogenic alpine vistas? Yes, but these endearing-looking guys aren’t exactly meek; mountain goats are some of the most belligerent of our ungulates, and both billies (males) and nannies (females) are well-armed with dagger horns. Not particularly flighty to begin with, mountain goats that become habituated to humans through food handouts (don’t do it!) or the tasty salt left on packs, clothes, and in urine can be dangerous. In 2010, a hiker on Klahhane Ridge in the Olympic Mountains was fatally gored by a 350-pound billy with a well-established reputation for approaching people. To avoid such violent encounters, give mountain goats plenty of space (noticing a theme here?). If one sidles up move away, and if the goat continues to advance, shout at it, wave your arms, and throw rocks if need be. Where to Be Aware: Mountain goats inhabit alpine ranges from the North Cascades and Northern Rockies all the way to Utah’s La Sals (though the more southerly mountains where they’re found today generally fall outside their historic native distribution and result from introductions).